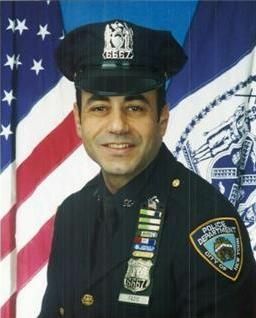 A 41 year old patrolman who had worked for the New York Police Department for 17 years, Robert Fazio Jr. was three years away from retirement when he saw the first plane hit the World Trade Center. He was called from his precinct to help people out of the shopping plaza beneath the World Trade Center. He saved many lives on September 11, and he sacrificed his own life trying to save more. Thank you for saving my husband on that day. You pulled him from the concourse, got him out and put him into an ambulance before you ran back in to save more lives. I didn’t even know him then, but your selflessness and extreme courage is to this day changing the course of lives. Please know that the man you saved is doing great things as a foster parent to children in need. He is a wonderful father to these children. Your legacy lives on in him, and in them, and in everything they and their children and their children’s children will do. They will know about you. You will never, ever be forgotten. I hope that it brings some comfort to the Fazio family to know that the story of Robert’s heroism will be carried forward for generations. This entry was posted in Legacy.com Remembers and tagged Obituary Guest Books, September 11, Tributes. Bookmark the permalink.